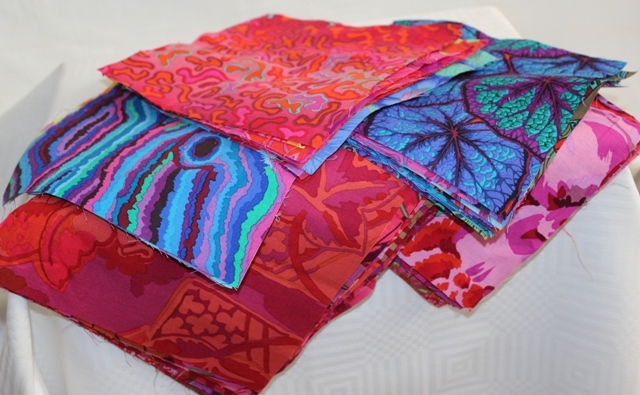 Canberra Quilters hosted a Biggest Morning Tea Quilting Bee on 3 June. Over $3400 was raised that will go to local cancer projects. Here are some images from the day. The theme was ‘Going for Gold’ – with prizes for decorated tables and people. Many busy hands, sewed, completed puzzles as well as a round the building marathon. Thanks to sponsors and members who donated items for the day and made it so successful. Canberra Quilters is hosting a Biggest Morning Tea Quilting Bee on Sunday 3 June, from 10am-2pm in the Cook Community Hub Hall. A tax deductable entry fee of $5 is payable at the door (or you can donate a larger sum). All proceeds go to the ACT Cancer Council for cancer research. There is a monster raffle as well as a quilt raffle and lucky door prizes. Lots of fun and table games. White elephant stall of used & older items. So bring some money to buy tickets or to grab a bargain. 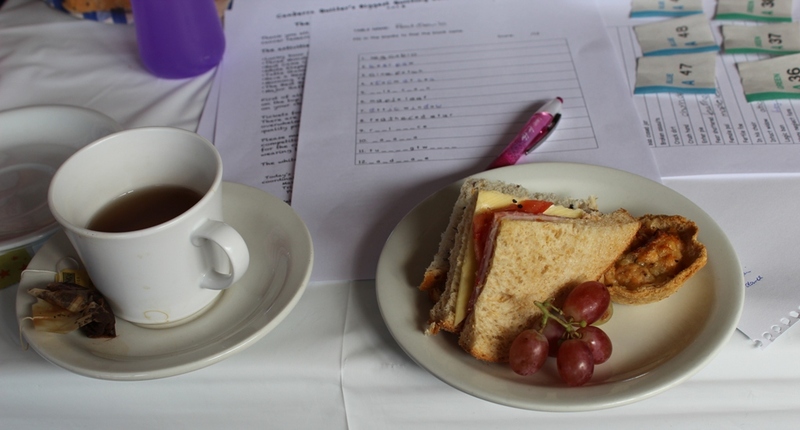 It would be great if you could bring a plate of food to share at morning tea- savoury or sweet. The theme is ‘Going for Gold’. Wear something athletic as a tribute to the Commonwealth Games recently held on the Gold Coast – or something gold and glittery because that is who you really are! Bring a needle and thread to sew as there will be some sewing challenges. There is a prize for the best decorated table / people, representing a sport from the XXI Commonwealth Games. Donations of new items for the monster raffle are welcome- place in the marked bin in the CQ storeroom or give to co-ordinators Margaret or Tricia. Donations of used/ older items for the white elephant table are also welcome, and can be made on the day. Canberra Quilters is hosting a Biggest Morning Tea Quilting Bee on Sunday 18 June, from 10am-2pm in the Cook Community Hub Hall. A tax deductable entry fee of $5 is payable at the door (or you can donate a larger sum). All proceeds go to the ACT Cancer Council for cancer research. There is a monster raffle as well as a quilt raffle and lucky door prize. Lots of fun and table games. White elephant stall of used & older items. The theme is Christmas in June. Wear something Christmassy. 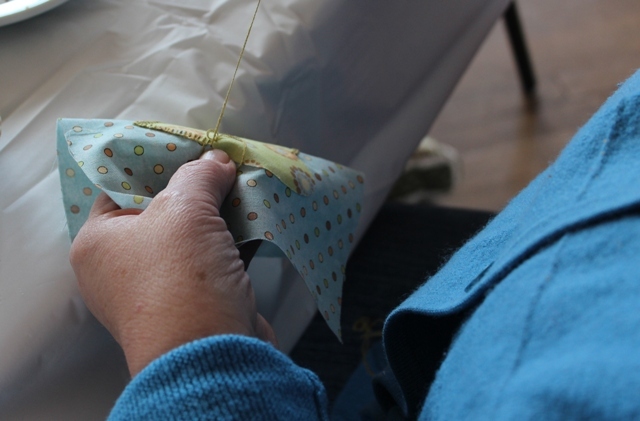 Bring a needle and thread to sew some Christmas decorations for charity. There is a cake competition, which will be judged by 3 semi-independent foodies. Bribery by $$ permitted, but not guaranteed. Cook your delights for all to share and you may win a prize. Donations of new items for the monster raffle are welcome- place in the bin in the CQ storeroom or give to co-ordinator Kay. Donations of used/ older items for the white elephant table are also welcome. They can be made on the day. Canberra Quilters is hosting a Biggest Morning Tea Quilting Bee on Sunday 29 May, from 10am-2pm in the Cook Community Hub Hall. A tax deductable entry fee of $5 is payable at the door (or you can donate a larger sum). All proceeds go to the ACT Cancer Council for cancer research. There is a monster raffle as well as a quilt raffle and lucky door prize. Lots of fun and games- including quilt bingo! White elephant stall of used & older items. The theme is hexies, so you can wear a hexi in some way – hat, brooch, earrings or clothes; or bring a hexi, hide a hexi! Bring a needle and black and white thread to sew some hexies during the day. These will be made into a fund raising quilt. Donations of new items for the monster raffle are welcome- place in the blue bin in the CQ storeroom or give to co-ordinator Kay. Donations of used/ older items for the white elephant table are also welcome. They can be made on the day. There is a monster raffle as well as a quilt raffle and lucky door prize. Lots of fun and games. White elephant stall of used & older items. The theme is hexies, so you can wear a hexi in some way – hat, brooch, earrings or clothes! Bring a needle and white thread to sew some hexies during the day. These will be made into a fund raising quilt. There is a cake competition, which will be judged by 2-3 semi-independent foodies. Bribery by $$ permitted, but not guaranteed. Cook your delights for all to share and you may win a prize. Donations of new items for the monster raffle are welcome- place in the bin in the CQ room or give to co-ordinator Kay. Donations of used/ older items for the white elephant table are also welcome. They can be made on the day. The Biggest Quilting Morning Tea will be held this Sunday 31 May, from 10am until 2pm in the Hall at Cook Community Hub. All proceeds go to cancer research, through the ACT Cancer Society. Donations to the raffle prizes are most welcome and must be in as new condition. Prior to the day leave them in the blue tub marked BMT, Cook store room or deliver to Vicki Priestly. Any used/older donations will be put on a white elephant table where you will be able to purchase a great deal. If you have something to donate to the white elephant stall, bring it along on the day. Left overs will be donated to charity. The Biggest Quilting Morning Tea will be held on Sunday 31 May, from 10am until 2pm in the Hall at Cook Community Hub. All proceeds go to cancer research, through the ACT Cancer Society. 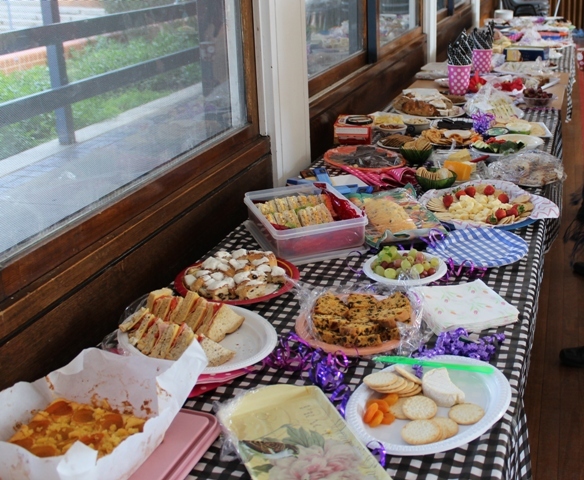 The Biggest Quilting Bee Morning Tea was held on 4 May and raised $2291 for cancer research. On the day there were lots of fun and games, raffles and lucky door prizes. Organiser Kay Provins and her team of Gail Stephenson, Mary Thompson, Beres Senden, Trish Norton, Barbara Brown, Pat Savas and Gaye Finlay organised a wonderful day for all who attended. We thank the sponsorship of Hobby Sew, Addicted to Fabric, Rosemont the Patchwork Shop, Bead Street, Stitch ‘N Time, The Scissor Man, Kippax Pharmacy, Helen Godden, Fiona Hammond ………… and also to our lovely members who contributed to both the raffle prizes and our white elephant stall. Quilts for Others were very generous in donating a beautiful black, white and red quilt for our major raffle. The Lucky Door Prizes were won by May Webb ( Light Box donated by the Scissor Man), Karin Malmberg ( fabric pack from Addicted to Fabric), and Pat Savas (pink hearts quilt donated and made by Joy Nelson and Kay Provins). Don’t forget the Canberra Quilters’ Biggest Quilting Bee Morning Tea is this Sunday, 4 May from 10 am until 2pm, in the Cook Community Hub Hall. All proceeds go to cancer research, through the ACT Cancer Society. Donate a bra for the Uplift program in the Solomon Islands. Bring your good condition unwanted bras for collection and donation to this program. We are having a cake competition again, which will be judged by 2 or 3 independent foodies. Bribery by $$ permitted, but not guaranteed.